You know your business inside and out. You know that listening to customers and responding to their needs is the key to staying competitive. Still, you might be struggling with where and when to survey your customers. A pop-up survey in your web app? Send them an email? What about a text message on their mobile phone? Figuring out the most effective channel to ask for feedback can be confusing. The good news is that you have more options than ever before. We’d like to help by giving an overview of where companies are engaging their customers, and how multiple channels can work together. Then, you’ll be better equipped to develop a plan that best meets your company’s unique needs. 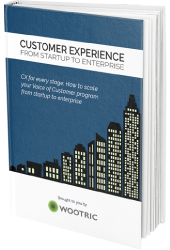 Start with a customer-focused approach: when, where and how do your customers want to give you feedback? This inquiry can quickly lead to a multi-channel approach. An improved survey experience helps you maintain high response rates. Not every customer wants to fill out an in-app survey, not every customer opens email in their inbox. However, a lot of people do want to give feedback, and appreciate the opportunity to do so. So your goal is to get more and more sophisticated about the “where and when” over time. 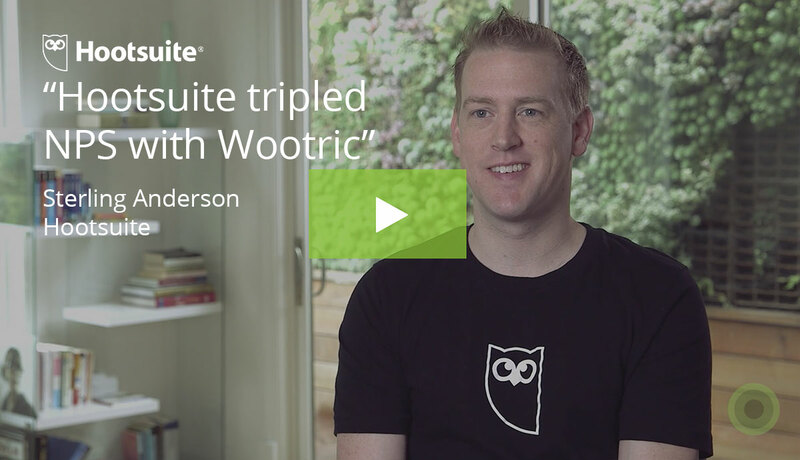 When you leverage more than one survey channel you can expand the pool of users you’re hearing from. You may have an email relationship with some customers, and in-product engagement with others. A multichannel approach also lets you choose the right channel for a given interaction, and to customize your Voice of the Customer program for your business model. Which Customer Feedback Channel is “Better”? Is one channel more brand-oriented or more transaction-oriented? Which is “better”? This is a very common question. We think the most important factor here is when you survey, rather than which channel. Here’s why. If you send an NPS survey right after purchase, you can expect that response to be more influenced by that last transaction. However, keep in mind, an NPS survey triggered by a transaction is still colored by the brand experience. Email: Lower response rates, but higher rates of qualitative feedback. Think about it: How often do you take the time to open emails from businesses, let alone respond? However, those customers who do take the time to answer a customer feedback survey via email are more likely to be invested in your brand and take the time to write comments that provide more detail to the “why” behind their score. In-app (Web or Mobile): Higher response rates, lower rates of qualitative feedback. In-app surveys can deliver contextual feedback, and we find that customers will answer the question they are asked. They are absolutely willing to provide higher level feedback when prompted in a web or mobile app. This is why in-app feedback platforms offer tagging, sentiment analysis, and other means of gleaning insight from the fire hose of data that many companies receive via in-app surveys. Nonetheless, fewer in-app respondents will take the time to give qualitative feedback. The high response rate that in-app NPS surveys deliver can be a positive trade off, especially for SaaS businesses focused on reducing churn. You may prefer to get a gut impression that you can follow up on rather than radio silence from a passive or unhappy user that ignores an email survey. SMS: With transactions, deliveries, and services, sometimes texting is the most effective and immediate way for you to interact with customers. It also allows you to grab customers in the place they tend to spend more and more of their time – on their mobile phones. 1. Targeting Distinct Stakeholder Groups with Different Channels. Consider the enterprise sales model as one that can benefit from both in-app and email surveys. Here we are talking about a SaaS company or other business with a very strong digital presence. 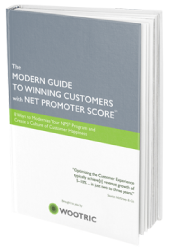 In this example, your company is using the Net Promoter Score system to measure customer loyalty. If your brand is an online product, we’ve seen huge success when you choose in-app surveys as your primary channel. This is because end users of a SaaS product relate to your company through your digital platform. They probably don’t open your marketing emails because they aren’t looking to be sold to. They just want to do their thing in your product everyday. 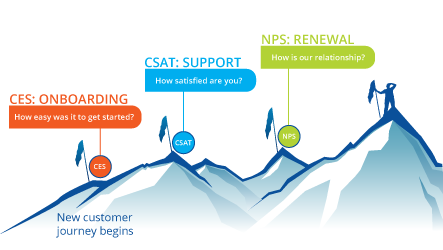 For them, it makes sense to give NPS feedback in-app, and they are mostly likely to respond there. Now consider some executive stakeholders or buyers of your platform. They don’t spend as much time in your product (if any), but you definitely want to know their opinion. For this group, delivering an NPS survey via email is likely the way to go, and email gives you a higher chance of getting qualitative feedback in their response. So, in this case, it’s the combination of in-app and email surveys that gets you the info you need. E-commerce is an interesting use case here. The e-commerce business often has a couple of different customer survey touchpoints: online and offline. Every customer needs to place an order–typically on a website or mobile app. It can be valuable to learn how a customer feels after the ordering process, and that survey can often happen in the web application. Once the product is delivered, the customer may register delight or dissatisfaction. For e-commerce businesses, it really makes sense to capture that sentiment via email or SMS because, honestly, if the customer had a bad experience, they’re probably not going to come back to your site to give you feedback. The power of those two surveys together—one in-app and one via email—can give you an insightful story of the customer journey, and it can only happen by tapping into multiple feedback channels. As companies evolve and develop new forms of business for growth, customers of those different products might require distinct feedback channels. A good example is a technology company that hasn’t fully migrated to the cloud and still has legacy software offerings. These types of businesses in transition have a software user base “on premise,” where the only option is to do an email survey. Newer, cloud-based offerings from the same company can opt instead for in-app surveys. Here is another example. A media company might get in-app survey feedback from subscribers or readers who visit their website. However, the same company may find that email surveys are a better channel to reach customers that receive subscription services via home delivery. Supplementing one channel with another may help you get a higher response rate. For example, if you start your feedback program with in-app surveys and you find that certain customers just aren’t using your application that frequently, or aren’t receptive to an in-app survey, then you have the flexibility to try another channel. See what those customers prefer to respond to–try an email survey, try SMS, or try surveying in a mobile app if you have one. That way, every customer’s voice is being heard on their terms. There are times when companies communicate with customers primarily through SMS. Think about your mobile provider, bank, airline, or ride share service. You expect to hear from them through that channel and count on the immediacy that texting provides. This is when it makes good sense to survey through SMS in addition to other channels, particularly for transaction-related feedback. 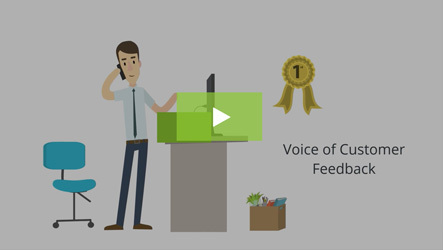 There are times when “it just depends.” Multi-channel customer feedback gives you the flexibility to survey customers based on the way they prefer to communication with your business. It lets you engage a broader segment of users across multiple touch points and lines of business. You can get the big picture, each step in your customer’s journey. And, it lets you meet your customers on their terms. Don’t risk filling your customer’s devices with unwanted messages. The sensitivity that multi-channel feedback offers can help you avoid survey fatigue. That means higher quality feedback to help you grow your company.